This post will explain how to clean concrete before sealing because if you coat over either new concrete or dirty concrete without first using a concrete grinder and diamond wheel or other methods below you will only achieve partial adhesion of the sealer in small areas and the majority of the floor will suffer from peeling after a few months or a year. There are special diamond wheels to remove glue or thick, self leveling coatings such as feather finish. Peeling is a layer of coating material that has never adhered fully to the surface and as it dries and hardens it de-laminates away cleanly leaving a bubble of air underneath. Thin, clear sealers will turn white where the adhesion has given way. The best test of adhesion to know if a coating is correctly bonded to the surface is to scratch the coating deeply with a sharp instrument like a screwdriver (through to the substrate) or to look for scratches and observe the edges. Well adhered paint will not split or splinter away from the edges of the scratch line while poorly adhered paint will leave a jaggered edge along the scratch where paint can be seen to flake away from the surface. To clean concrete before sealing the surface needs to be free of any contaminants and be porous to allow the sealer to key into the concrete. Concrete that has been weathered for years may already have the shiny top layer removed naturally and all it needs is a good clean with a water jet to prepare it. As a test you should hand scrub a few small areas the size of your hand with laundry powder detergent, water and a stiff brush, then rinse it and allow it to dry before giving it the drip test. Suppose all areas absorb water immediately, you could water jet clean the entire area and then paint when it is dry making sure that the first coat is thinned 10%. Water jet cleaning of concrete is quick, easy and an excellent way to prepare worn concrete because it removes dirt, algae and dust from the small pores of the surface. As long as it is rinsed properly without leaving residue to settle back into the pores the concrete is ready to coat immediately it looks dry. There are two main concerns with preparation of worn concrete – one is sheltered sections that still have a tight surface which will have to be opened and the second is oil that has soaked into the concrete. Oil will eventually soak right through concrete over time aided by the sun to lower its resistance and the opening and closing of the concrete when it heats up and cools down. The good news is that you only have to remove it from just below the surface to achieve good adhesion and once the paint has dried it will stop the oil from returning to the surface unless the oil is very wet all the way through. If the oil is very wet you will need to extract most of it first with a solvent and an absorbent that can be found in any hardware. To extract oil from concrete you need to wipe the area with a rag after applying Turpentine or a similar solvent to remove most of the surface material. Then cover the area with an absorbent product such as is used in cat baskets to absorb waste and apply more Turpentine to wet it. The clay kitty litter is best. Cover with plastic sheet and allow it to work overnight. The oils will be diluted and as the solvent evaporates it will be trapped in the absorbent. Very bad areas may need two treatments. Oil stains including those treated with the solvent can often be removed with simple laundry detergent powder and water, however the older stains will contain dirt so the stain may be impossible to remove completely. Wet the surface and sprinkle with the detergent, rub it in with a broom making a wet paste and leave it for 30 minutes if possible wetting it slightly during this time if it appears to be drying out. When rinsed the stain should have vanished or be mostly gone like washing an oily frypan, but it may return within 12 hrs in hot weather as the oil comes back up to the surface again. It is only necessary to apply the paint to a clean surface, not to remove all the oil deep down because the paint will normally dry before the oil can return to the surface so oil in the concrete below the surface should not be a problem. This is more so for a two pack product which will chemically cure on the clean surface and lock in the oil. If oil happens to migrate to the surface darkening it before you can coat it, it can be cleaned again, dried and painted as soon as possible to allow the paint to dry before the stain reappears another time. Using a wet vacuum will dry the areas quickly without wetting the rest of the concrete. 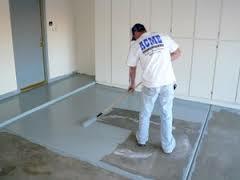 These three processes will remove the shiny area on top of the concrete and open up the porous concrete underneath. When this has been achieved your paint will adhere strongly until it finally wears out through constant use. How to clean concrete before sealing using acid etching requires caution due to the possible health problems and the damage it may do to plants, clothing or nearby equipment. This article will describe the basic process, but you must follow the safety instructions given to you by the seller of the product or as indicated on the label. Being tidy and careful is the key to using acid successfully. Hydrochloric acid which is mainly sold for brick cleaning will attack the lime in the concrete and dissolve the bond. When it is used to clean a concrete floor, driveway or pavement it is quickly neutralized or mostly neutralized on contact or when the fizzing has stopped so it only acts on the surface. Usually a mix of 10 parts of water to one part of acid will be strong enough to remove the polish from the surface. If you wear correct protective clothing, gloves and eye protection and take care not to splash, the best way to apply the acid is with a long handled paint roller with a deep pile cover. Apply it liberally and slowly enough to prevent a spray. After applying the acid/water mix and before it dries thoroughly water jet clean the concrete by blasting it with 3,000 psi close to the concrete with a fan jet, rinsing is not good enough to remove the surface particles and a rotary jet (like a lawnmower) is the best way. When the concrete is dry apply the first coat of paint. This is better left to the experts who know what power of machine to use, what size shot and how fast each pass should blast the surface. These machines throw small steel balls at the concrete within a sealed chamber by passing the shot through a fast-spinning paddle wheel. The shot hits the surface, breaks it open and then bounces back up the return chamber to be recycled while a vacuum system separates and removes the dust and grit. Shot blasting can open the surface more than intended and leave deeper grooves where the blasting overlaps so it is not ideal for home applications. These devices come in all shapes and power sizes as well as wheel configurations, from small hand held angle grinders with a dust extraction shroud and diamond grinding wheel to sit-down versions large walk-behind machines that have multiple wheels underneath. For driveways that need only the edges opened at the surface an angle grinder set up as a concrete grinder is ideal. It will grind dry and the dust collector will remove all the dust as you work. For larger areas more than the edges a sit down grinder (see video below) or stand up grinder using an angle grinder as the motor source will be faster and easier. There is a dust extraction shroud that even gets into the corners and most have edging features to grind against walls. They work by using a spinning wheel in contact with the concrete that has diamond segments welded to the wheel. As these diamonds come in contact with the concrete they wear away and grind off the top surface. The dust extraction shroud contains all the dust and the dust collector removes it without airborne particles. Once your surface is open and clean apply the first coat thinned 10% to soak into the surface as deeply as possible. If your preparation is good it will look dull and lifeless when it has dried. Depending on the coating, apply another coat once the first has fully dried which will give you a glossy, uniform finish. Apply a third coat if a greater thickness is required for better wear.